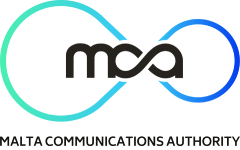 The Malta Communications Authority (MCA) is today publishing the results of a Household Perception Survey. The following are the main highlights of the study. 94% of respondents claimed that they were satisfied with the overall quality of MaltaPost’s postal services (89% in 2014). Since 2014, the average amount of money spent by households on posting articles in the last 12 months increased, with 23% of households spending more than €20 annually, as against 16% in 2014. 58% of respondents claimed to have received the same number of letters in the last 12 months, whilst those claiming to have received fewer letters increased to 32% from 22% in 2014. 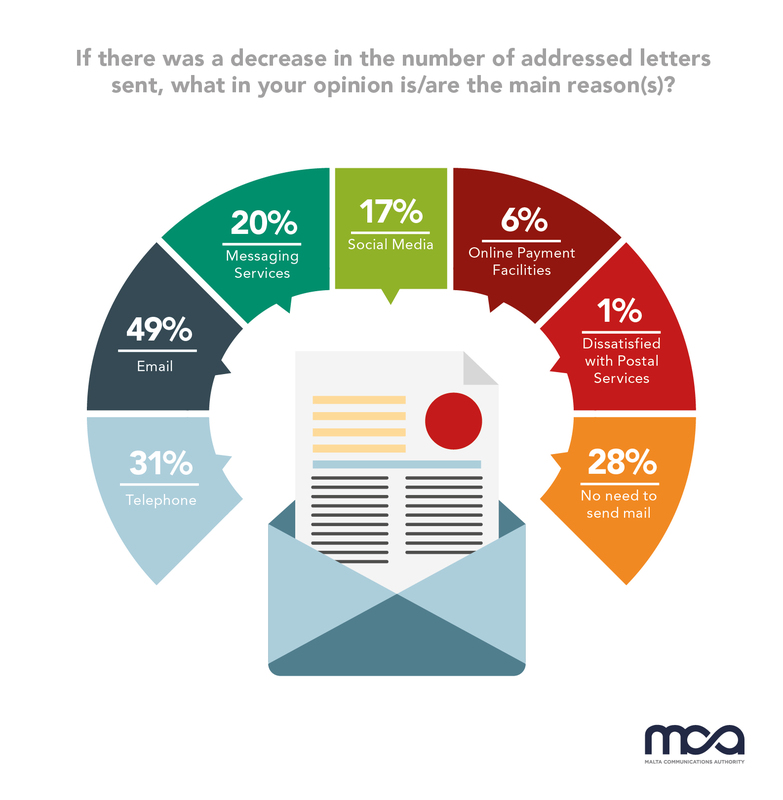 With regard to the amount of letters sent, 56% of respondents claimed to have sent the same number of letters over a one-year period. This figure is consistent with that reported in 2014. Respondents who claimed that they sent fewer letters in the last 12 months were asked which alternative they used and, as in 2014, email was by far the most frequently used alternative, followed by the telephone, and social media. It was also noted that the number of respondents who did not find it necessary to send mail grew from 16% in 2014 to 28% in 2016. 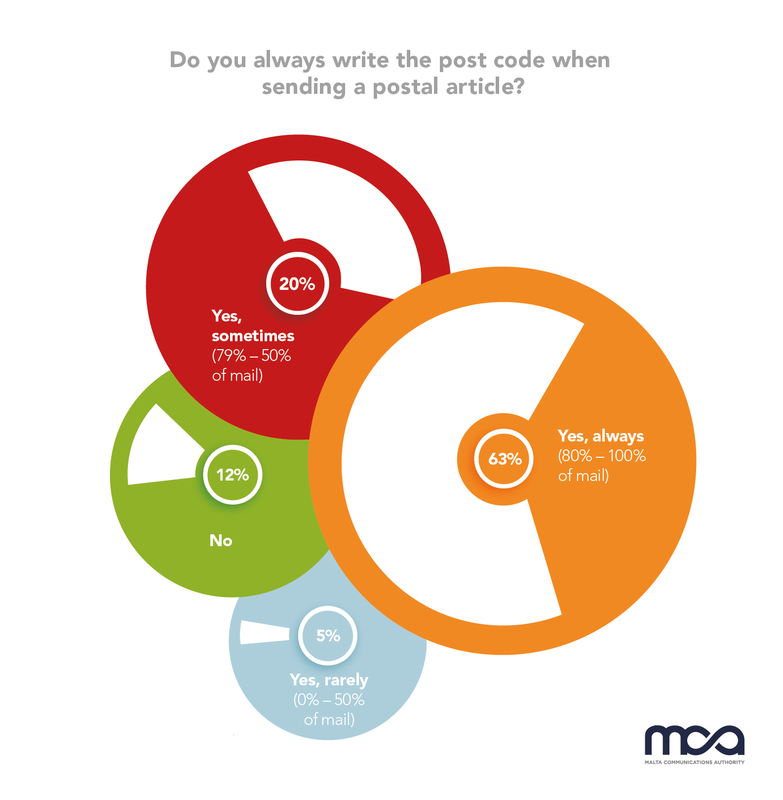 With respect to postcodes, 63% of respondents claimed to always write the postcode when sending a postal article. This is in marked contrast to awareness of MaltaPost’s postcode finder which can be found on its website, where only 33% claimed to be aware of the postcode finder. Despite the fact that 74% of respondents find the price of letter mail reasonable, results indicate that consumers are increasingly price sensitive. 51% of respondents, up from 38% in 2014, claimed that they would switch to non-postal alternatives if the price of a 50g letter were to increase by 5 to10% (i.e. the price would increase from 26c - 29c). Although price is still a strong factor when it comes to choosing postal services, speed may not always be given top priority. Since 2014, the proportion of respondents who find next-day delivery (D+1) to be the only acceptable lead-time fell from 64% to 58%. In fact the number of respondents who claimed to find a D+2 service acceptable, increased from 28% to 32%. 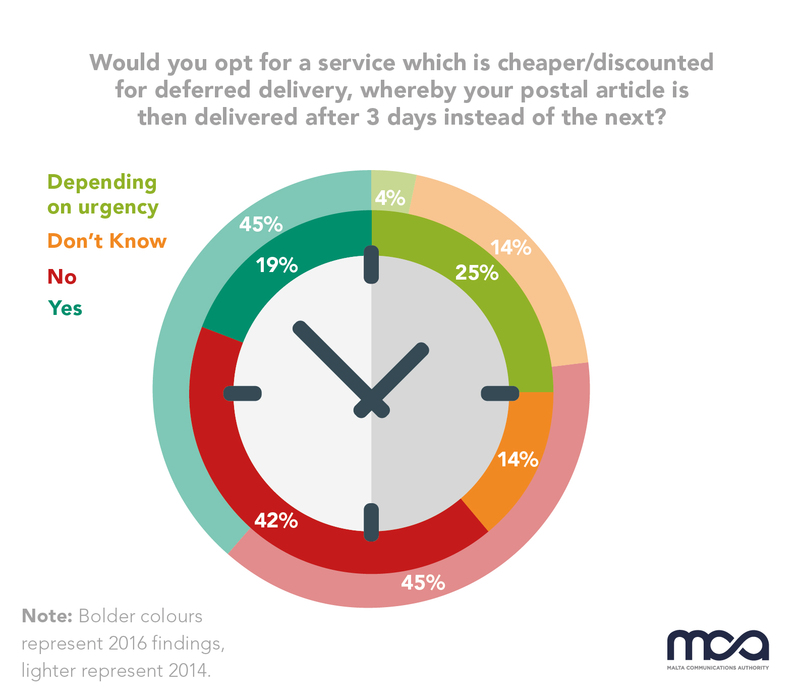 Furthermore, the proportion of respondents who would, depending on the urgency of their item, opt for a D+3 service, which is generally cheaper, increased from 4% in 2014 to 25%. Despite a drop in the number of letters received, when asked if they would find a 5-day delivery week acceptable, 73% of respondents replied in the negative. Those respondents who answered positively were further asked which day, Saturday or Monday, they would remove delivery from. 69% of the respondents preferred to remove Saturday (i.e. mail would be delivered between Monday and Friday). 52% of respondents claimed to have received a parcel within the last 12 months. MaltaPost was by far the most frequently mentioned operator (90%), followed by DHL (61%). Of those individuals who received parcels through MaltaPost’s service, 83% were satisfied with the service (up from 71% in 2014). When asked how they prefer to receive parcels respondents’ primary choice was to have the parcel delivered to the address indicated (88%); at 5% there was little, but equal, interest in picking up their parcel from the head office/depot on the same day or from the closest post office on the following day. 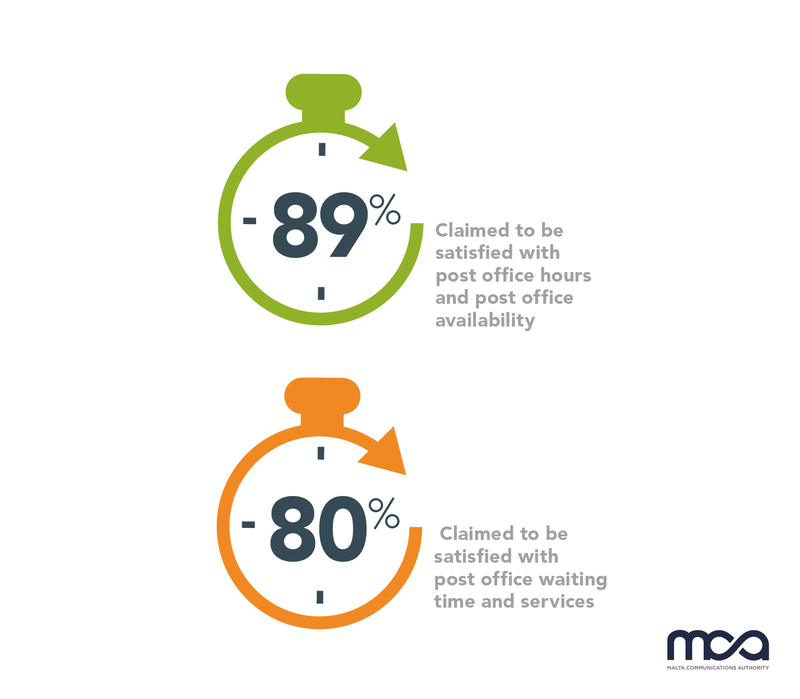 With regard to instances where respondents were not at home to receive parcels, 77% preferred to collect parcels on the next day from the nearest post office, followed by same-day collection from the head office (25%). 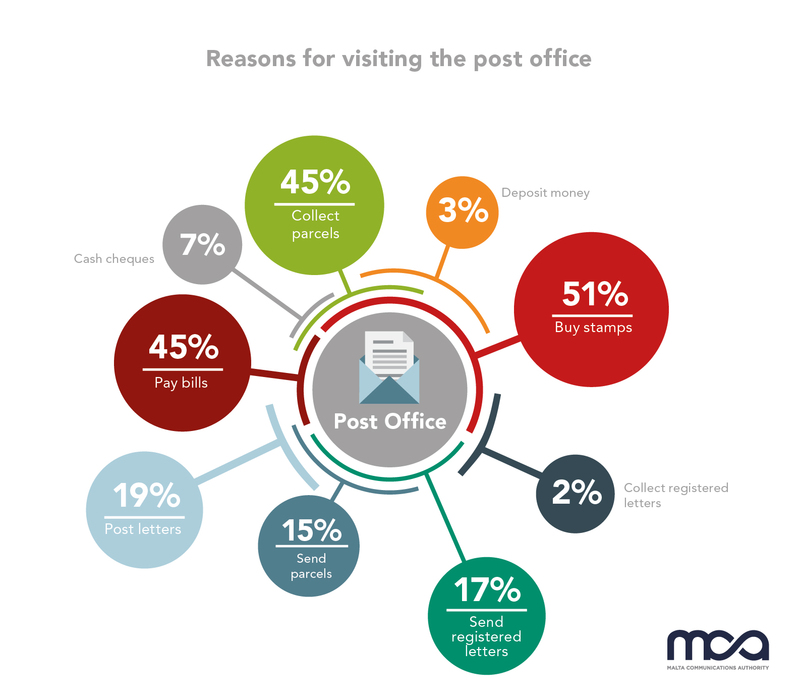 84% of respondents claim to have visited a post office in the last 12 months (70% in 2014), of which just under half claimed to have visited the post office every quarter (30% in 2014). Several respondents cited queues as the reason for not visiting the post office. The most popular services received in a post office include buying stamps (51%), collecting parcels and paying bills (both at 45%). In 2014, the number of respondents who claimed to have visited the post office to collect a parcel stood at 27%, clearly indicating increased activity in this regard. 10% of respondents claimed to have made a complaint to MaltaPost within the previous 12 months. The most common complaints related to misdelivery (25%), a reduction of 11% since 2014, followed by delay (17%), which increased by 4% since 2014. Of those respondents who claimed to have filed a complaint, 71% were satisfied with the way their complaint was handled, a significant increase from 28% in 2014. 98% of respondents claimed to have made use of MaltaPost’s website in the last 12 months, which represents a substantial increase since 2014 (20%). This round of research has shown consistency with previous studies carried out by the MCA in a number of key areas. The trends observed over the past years include decreasing letter volumes, increased usage of email as a substitute for letters, an increased acceptance of deferred delivery, and a general shift in usage towards parcels due to heightened eCommerce activity. As regulator for postal services, the MCA carries out research on a regular basis. The aim of this research is to guide the Authority’s decisions, the effects of which are felt by consumers and businesses alike. This survey was carried out carried out via telephone between October and December 2016. 500 respondents over the age of 18 were chosen randomly in order to create a representative sample, with each respondent identified as being the person mainly responsible for the mail in their household.